Starting the day off with a healthy breakfast makes a huge difference in the quality of your day! Lately, I’ve been on a smoothie kick. With smoothies, you can let your creativity shine. I enjoy throwing different ingredients in my blender to see what I can come up with. It’s also really easy to make them healthy without your family knowing. Throw some spinach in your fruit smoothie next time. I bet no one will ever know! I love using So Good fortified soy beverages in my smoothies. My favourite is vanilla. It adds a delicious flavour and is nutritious. So Good beverages are an excellent source of calcium, protein, riboflavin, vitamins A, D2 and B12. 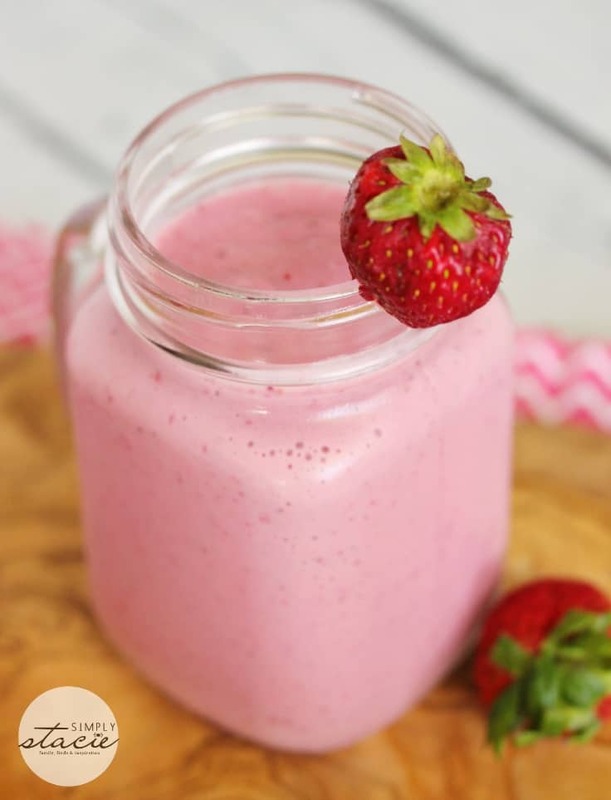 I was asked to create a recipe with So Good and I’m so excited that my Strawberry Vanilla Smoothie is on the Best Health Magazine Facebook page! I also have a Smoothie Tip with my recipe. My recipe is on the bottom left of the page. What I love the most about this recipe is how decadent it is. It’s almost dessert-like, yet with so many amazing nutritional benefits. It’s thick, creamy and satisfying. It fills me up till lunch! I like to use frozen fruit in smoothies because it makes it naturally cold. If you only have fresh strawberries, add a little bit of ice in your blender. Silken tofu makes it thick and creamy and takes on the flavour of whatever you put in your smoothie. You won’t even know it’s there (and neither will the kids!). It adds a nice protein punch to your morning. With school starting in a few short weeks, I’m working on getting the kids (and myself) back into a routine. One thing I’m doing is leading by example and drinking a healthy smoothie for breakfast. I stress to them that breakfast is the most important meal of the day so I needed to follow my own advice. For more smoothie recipes made with So Good, check out the Best Health Magazine Facebook page. I’ve marked down several I want to try! You might also like this yummy Orange Julius recipe. 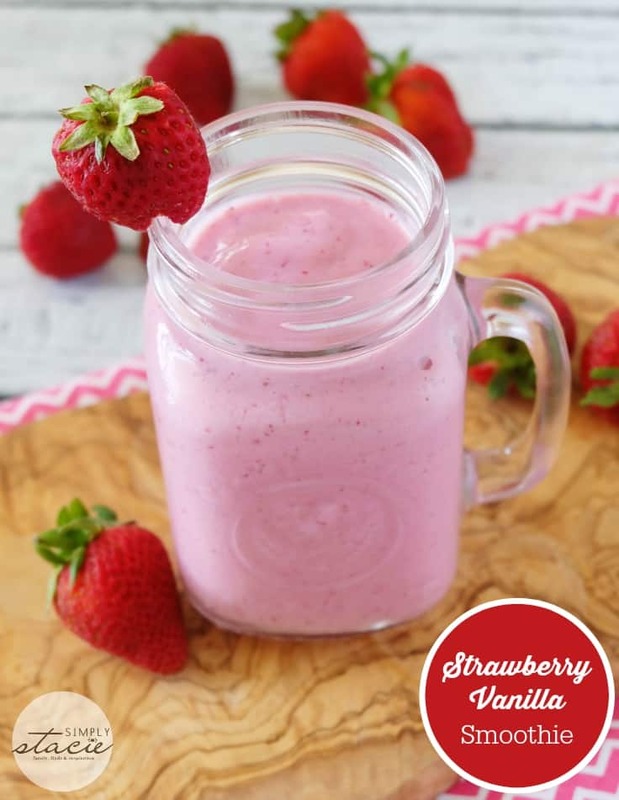 This Strawberry Vanilla Smoothie recipe is thick, creamy and healthy. You may be surprised by the ingredients! Add ingredients into a blender and blend until smooth. Garnish with fresh strawberries (whole or sliced), if desired. I love my smoothies, you can have them anytime of the day, I have never tried silken tofu before and very curious about it, what does it resemble? I’m not a fan of tofu, so I’d probably have to substitute something else to thicken it up a bit. Tofu is great in a smoothie, thickens it but doesn’t add any flavor. I will have to try the soy milk next time. This looks so yummy and refreshing for summer! I am not a fan of Silken tofu but might have to try it in this smoothie recipe and see if it works for me. Thanks. I’m so gonna have to make this smoothie! 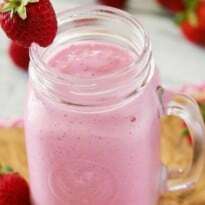 My favorite smoothie recipe is strawberry banana. I would never have thought to add tofu to a smoothie, this is very interesting. I can’t wait to give this a try. Thank you for sharing this recipe. Congratulations on being featured on Good Health Magazine! Yum! Looks refreshing and delicious. Pinning! I would enjoy your Strawberry Vanilla Smoothie right now. Hope you are having a great week and thanks so much for sharing with Full Plate Thursday. Your recipe is featured in The Top Ten on Full Plate Thursday this week. Hope you are having a great day and enjoy your new Red Plate.